Casa Damiana features over 6,000 interior square feet of modern finishes with old world architecture, surrounded by lush gardens overlooking the 16th hole of the world-renowned Jack Nicklaus Ocean Golf Course & the impressive shoreline of the Sea of Cortes & Punta Ballena. The home is located in the double gated community of Cabo del Sol, she sits along the edge of the fairway and is as close to the beach as you can get in this community, it will take you 2 minutes to walk down. Casa Damiana & Casa Sahuaro are two sisters 6 bedroom 6.5 bath villas, that sit side by side & are interconnected by a gate, which is hidden behind lush landscaping. So if you are looking to for a 12 bedroom villa, this would be your best option. You will enjoy the tasteful decorations throughout the villa & how each bedroom has its private pergola, perfect for reading & taking siestas. All bedrooms have en-suite bathrooms, with travertine & modern fixtures. 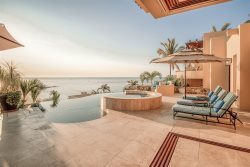 In the main house there are 4 ocean facing bedrooms, 2 of which are masters with access to the pool and wonderful palapa area, the two back bedrooms face the ocean & also have lush gardens providing privacy. There are two separate casitas both have en-suite bathrooms, inside & outside sitting areas. The casita that is above the garage also has a kitchenette. All bedrooms have access to the pool from their terraces. The kitchen is fully stocked with modern appliances & items to make your cooking experience easy. You have access to the pool from the kitchen & quick access to the outdoor gas BBQ. You’ll love living outdoors with the wonderful amenities Casa Damiana has; Swim up palapa wet bar, outdoor dining area, outdoor shaded living area, fire pit, infinity edge pool & Jacuzzi & lots of areas to sun. You are just a few steps to a private cove, where we can probably bet you won’t see anyone! Casa Damiana & your LIFESTYLE team are waiting for you.